Oil on panel, 38 x 59 cm. Even though the landscape painter Isack van Ostade spent most of his years in Haarlem, only a handful of his works depict the cityscape of his hometown. He instead preferred to depict the vibrant life of the villages in the countryside where travellers and peasants regularly crossed paths. 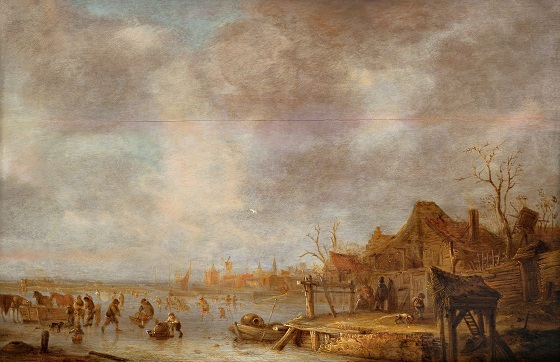 In this painting of a winter landscape outside Haarlem, there are two peasants, a burgher couple and a boy with a dog, while Haarlem’s church steeples and a mill can be seen in the background. Around the start of the 17th century, several artists (such as Esaias van de Velde and Claes Janszoon Visscher) began making landscape etchings, which often depicted winding roads where travellers made their way from one village to the next, occasionally taking up lodging at a local inn. Isack van Ostade continued in the same vein with his village paintings, which often combine everyday scenes from life in the Dutch countryside with evocative landscapes.